Well PBS friends, we can *finally* stop mourning the end of Downton Abbey because Masterpiece is giving us a new “little” miniseries to enjoy, and this one takes place in the United States. And it goes by the name of Little Women. PBS and Masterpiece have, once again, teamed up with Playground (the production company behind Wolf Hall) to give us our new obsession — a three-part adaptation of Louisa May Alcott’s iconic novel, Little Women. The new series will be written by PBS vet Heidi Thomas, creator of popular PBS series Call The Midwife and directed by Vanessa Caswill (Thirteen). We’re seriously struggling to contain our excitement for this new series. Little Women was such an important book for us growing up. It taught us a lot about what it means to be a strong young women, and is definitely a classic — even though it is a *dense* book for a child to read. We can’t wait to travel back to 1860s Massachusetts and watch as the March sisters (Jo, Meg, Beth and Amy) grow up during the civil war with this new adaptation. 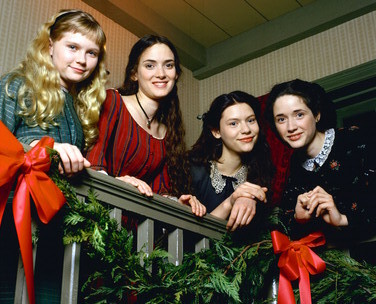 Little Women was adapted into a movie in 1994, starring Claire Danes, Christian Bale, Kirsten Dunst, and Winona Ryder. While we’ll miss swooning over Bale as Laurie in the new series, we can’t wait to see who is cast!